Preparing for his meeting with Russian President Vladimir Putin later today, US President Donald Trump and First Lady Melania Trump were given a tour of the presidential palace in Helsinki, Finland, where they were received by Finnish President Mr Sauli Niinisto and his wife Ms Jenni Haukio. Mr Trump claimed before the highly anticipated summit that relations with Russia had never been worse and therefore whatever came out of the meeting could only help to improve those. One of Mr Putin’s most vocal critics and a leader of the Russian opposition, Mr Garry Kasparov, claimed that Mr Trump should not aim for a normalization of relations with his Russian counterpart at this would justify the Kremlin’s recent actions. 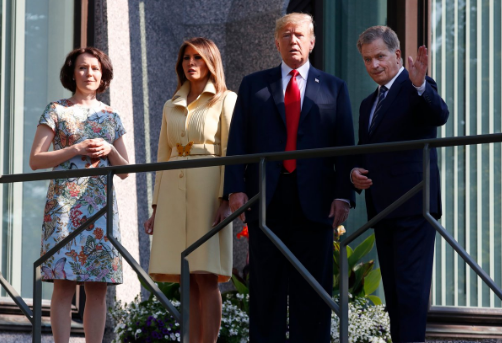 After meeting the Finnish presidential couple, US President Donald Trump thanked them both for their warm reception in Helsinki. He now moves on towards his summit with Mr Putin. The Helsinki summit will mark the final stage of a weeklong trip to Europe for the US’s Presidential couple after they visited a NATO summit in Brussels, had tea with Queen Elizabeth in the UK and spent the weekend in Scotland for a private two day vacation. We have great faith in you! relations with Russia are terrible because THE FAKE NEWS LIBERALS keep attacking Trump over Russia. The Liberals want more war to further their globalist agenda and Russia and China stand in the way.